Decent new martial arts films from China or Hong Kong have been getting thin on the ground of late after the boom they enjoyed in the early 2000’s. That’s why I got very excited when the recent Call of Heroes ended up meeting my high expectations. 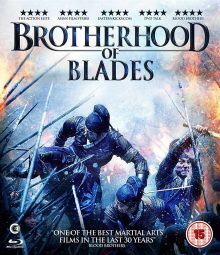 Hot on its heels (in terms of a UK release date at least) is Brotherhood of Blades. Directed by Yang Lu, a newcomer to action movies, and featuring none of the big martial arts stars, I was nonetheless excited to check it out, as word of mouth was good and the marketing made it look impressive. Brotherhood of Blades is set in late Ming Dynasty China and follows three friends, Shen Lian (Chen Chang), Lu Jianxing (Qianyuan Wang) and Jin Yichuan (Dong-xue Li), who are skilled members of the Imperial Assassins. All three of them are struggling with personal problems which could be solved with a large amount of money. 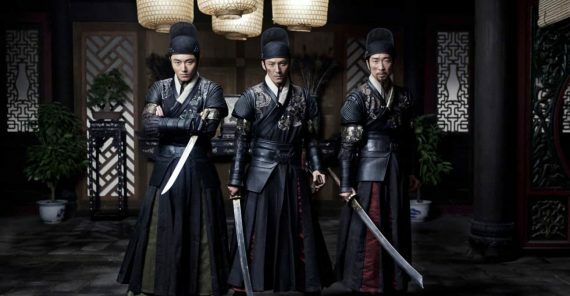 Well, luckily for Shen Lian, when the three assassins are assigned with the mission of killing Wei Zhongxian (Shih-Chieh Chin), Shen is offered the chance of taking bags full of gold away with him in return for faking Wei’s death. When he takes up the offer however, he makes life incredibly difficult and dangerous for himself and his two friends as their honesty is put into question and they realise they’re being used as pawns in a much larger game. This film didn’t impress me quite as much as Call of Heroes did unfortunately, but it’s still a solid entry to the wuxia genre. It’s handsomely presented – lit and shot beautifully with some lavish period production design. It’s a lot of fun too, moving along at quite a pace with a healthy amount of action spread throughout. The choreography in the fight scenes is nothing special though and a little shaky cam and fast cutting is used to hide this (alongside some dodgy CGI blood), but the action scenes are still quite exciting. This is helped largely by the drama, which is amped up whenever possible by pushing the stakes higher or through good use of the elements. Like Kurosawa liked to do with his action scenes, Lu sets scenes in the rain, snow or surrounded by fire to heighten the emotions. There are some suitably slimy villains too, helping provide people you really want to be beaten. It’s nice to see that the good guys aren’t all squeaky clean either – they have flaws to keep them grounded. The film is a bit overstuffed though. There are a lot of intertwining plot threads. It’s not confusing due to this, as they’re handled pretty well, but it feels slightly over the top and I think the film would have benefited from some narrative streamlining. The stories don’t have the emotional impact they should for instance, because the film rushes through them all. All in all it’s an enjoyable action epic, but nothing particularly special I’m afraid. It’s very dramatic and well made, but doesn’t feel like anything we haven’t seen before, occasionally done better. 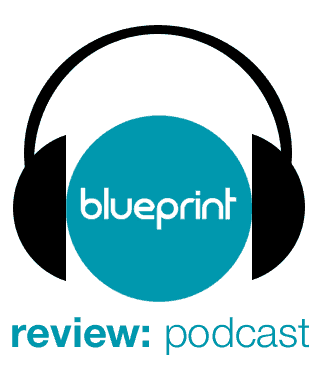 So fans of the genre should have a good time, but it’s not going to win over any new converts. 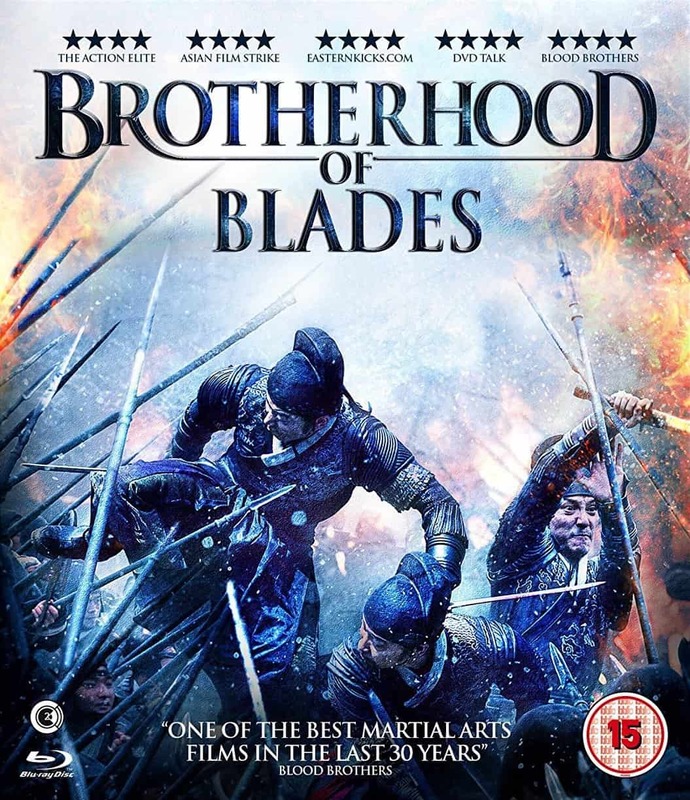 Brotherhood of Blades is out today on Blu-Ray, DVD, on-demand and download in the UK, released by Second Sight. I saw the Blu-Ray version, which looks and sounds fantastic. There are no special features included though unfortunately (at least not on my screener).